The whole point of SEO is making it to the top of the search results. In the example we are searching for a “2014 Toyota Corolla Everett”. Something to note for this search is that this dealership is not in Everett and there is a different Toyota dealership in Everett. 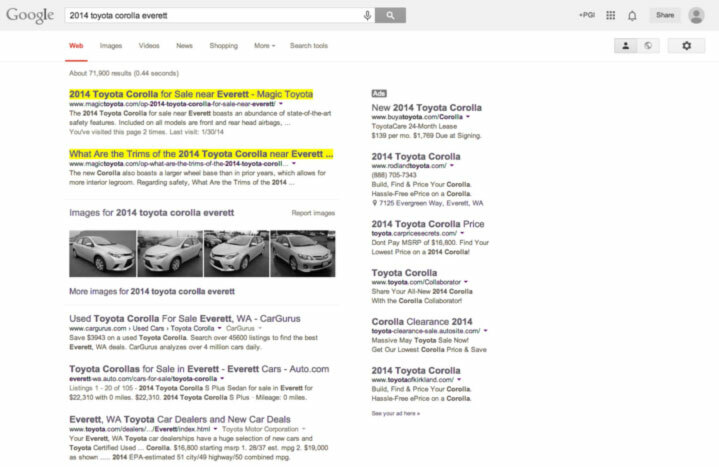 The results are obvious; the top two search results are from Magic Toyota a Content Motive customer. This search is considered a long tail search. Long tailed searches have the most untapped potential in search results and expanding your website’s search presence. Is your dealership ready to increase leads and search engine rankings to their max potential? A Content Marketing Strategy expands your websites presence in search results far beyond what what could be possible normally. The post Long Tailed Searches out of market appeared first on Content Motive.